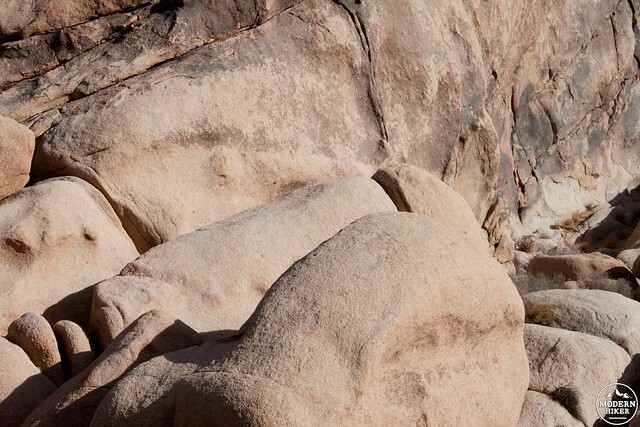 Joshua Tree doesn’t fit the typical National Park mold of catering primarily to auto tourists. However, what the park lacks in breathtaking roadside attractions it easily makes up for with a slow desert pace and numerous easy hiking trails to hidden treasures. This hike takes you to Arch Rock, one of those just-off-the-road landmarks, and then continues on a short spur trail to Grand Tank, a historic reservoir. 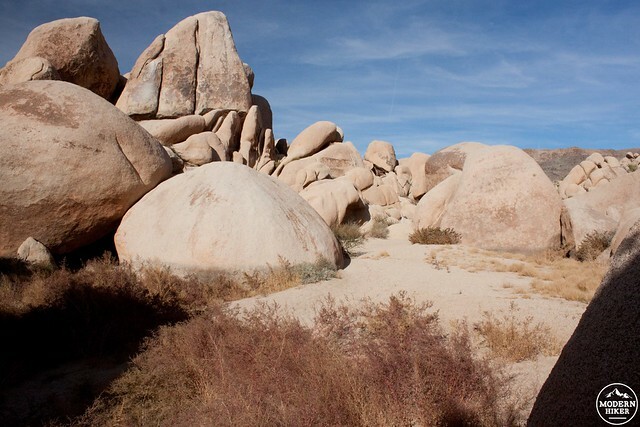 The trailhead for both Arch Rock Interpretive Trail and the spur to Grand Tank begins in White Tank Campground along the northern end of Pinto Basin Road. Park in the small day-use lot found just after site #8, please leave the campground sites open for folks who will be staying the night. The first section of Arch Rock Trail parallels the backside of White Tank Campground. This campground is one of the smallest in the park and offers a more peaceful atmosphere than nearby Jumbo Rocks and Hidden Valley. Avoid staying in sites #13 – #15 since the trail runs directly behind them. The trail to Arch Rock is dotted with interpretive signs which expand on the fascinating geologic processes that created this landscape. Take time to read these signs as you make your way counter-clockwise towards the arch. After 700 feet the trail turns sharply to the right and deposits you at the base of Arch Rock. While it doesn’t compare to the incredible rock formations found at Arches National Park, this 30 foot granite arch is still quite beautiful. 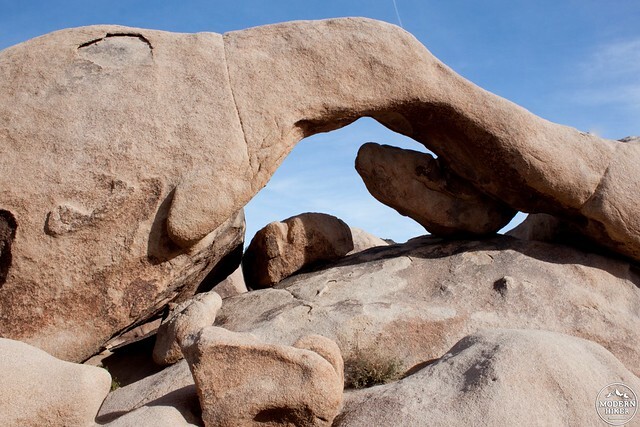 An easy scramble grants access to the inside of the arch for great views and perfect pictures. You can even access the top by carefully walking through the arch then scrambling up the right hand side — just make sure you can downclimb everything before you head up. 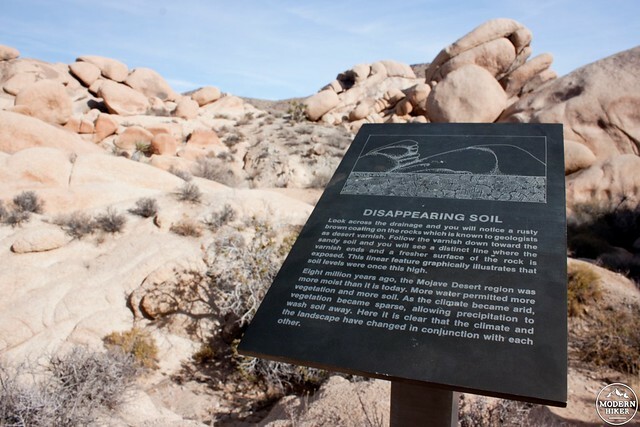 Once you’ve gotten your arch fix, continue along the trail a few steps until you see the interpretive sign titled “Disappearing Soil.” This sign is the landmark to leave the established trail and head along the spur trail to Grand Tank. This section requires beginner route finding skills. If you are not comfortable with off-trail travel, then completing the Arch Rock loop is your best bet. From the “Disappearing Soil” sign aim straight east. A subtle social trail dips down into a wash and then climbs up a loose sandy hill through a notch just left of the big rock pile (visible in the above photo – 1700 feet from the trailhead). Take a moment to observe the faint white line found about 3 feet high on these rocks as you pass by. This line delineates the old level of the ground, over 8 million years ago. 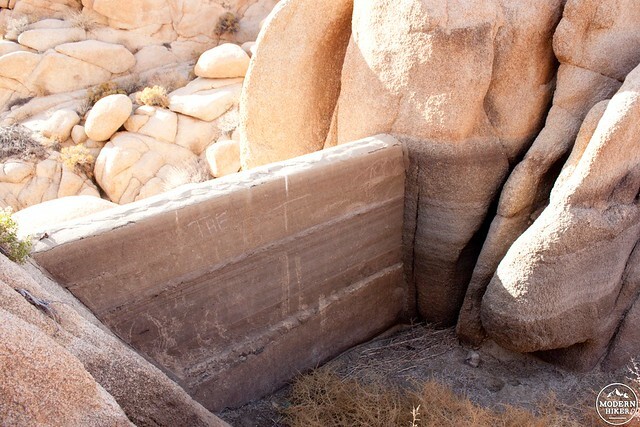 Erosion has worn away the ground layer exposing over 3 feet of rock, a great example of how the granite in Joshua Tree is slowly transforming. From the top of the notch stay on a trajectory straight east. You’ll dip into another wash before scrambling through a jumble of rocks. There are two route options in this section. Option A follows the rock slabs to your left as you enter the wash — this route is easier and more defined. Option B enters the talus caves directly above the wash. You can wind your way through this small cave section — a fun addition to the hike, though the route isn’t easily found. Either way you’ll end up on top of the second notch, looking down into the Grand Tank reservoir. Small concrete dams were erected by ranchers in the late 1800’s in naturally forming reservoirs such as this one. The added dam would trap winter and spring runoff and create a fairly predictable water supply for livestock over the hot summer months. Visit any of the tanks throughout the park after a rainfall for an working example of just how effective these small dams are. Once you have explored Grand Tank, return to the “Disappearing Soil” by retracing your route. 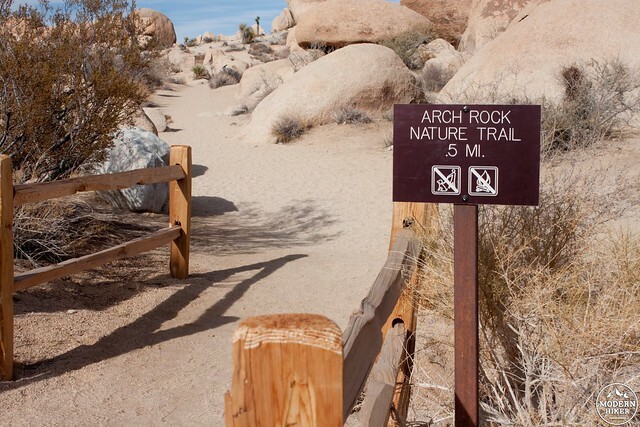 Hang a right at the sign to complete the short Arch Rock Interpretive Trail and arrive back at your car. The Arch Rock section is a well established trail. Pay attention to where rock barriers are in place to make sure you stay on track. The spur to Grand Tank follows a subtle social trail directly east from the "Disappearing Soil" sign. The trail is loose in places and requires some scrambling. This trail starts in White Tank campground, which offers 15 first-come first-served sites for $15 per night. Pit toilets, garbage, recycling, picnic tables, and fire rings are found throughout this campground. 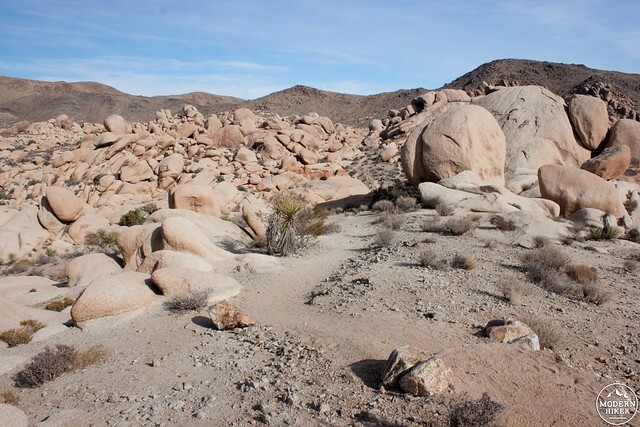 The is NO WATER inside Joshua Tree National Park, so make sure to bring an extra supply into the park with you. 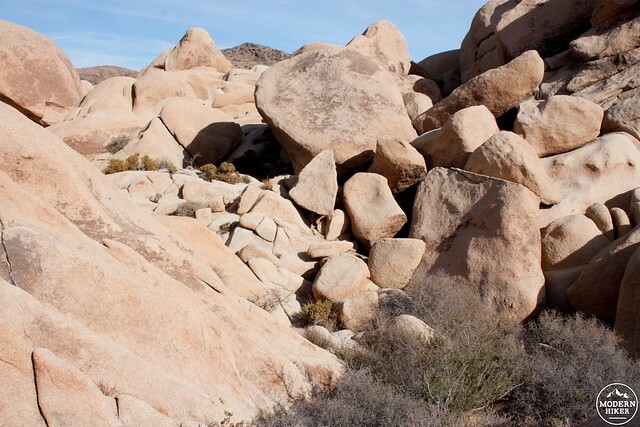 The trailhead for Grand Tank and Arch Rock is located in White Tank campground, along Pinto Basin Road, 2.7 miles south from the junction with Park Boulevard. Park in the day use area near sites #8 and #9.